There are several ways to view Appcues data. We highly recommend integrating Appcues with your third-party tools analytics tools to evaluate Appcues KPIs with your own platform usage data. You can view a list of tools we integrate with here. Are enough users seeing my flows? Where are users falling off within my flows? Is my flow too long? Should I eliminate a step? Congratulations! You've installed Appcues, customized your theme, designed your flow, and published it on your site! Once your flows have been published long enough to get some real exposure to users, you're going to want to see how they're performing and make changes as necessary. This doc can help! 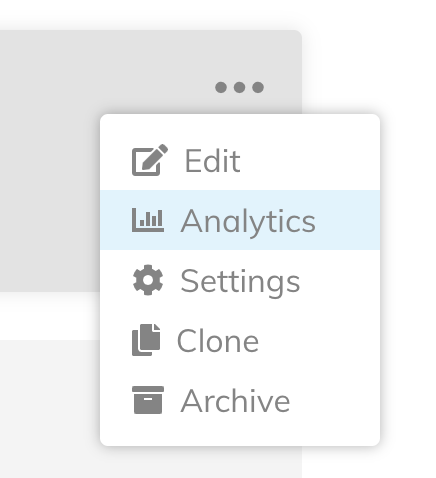 For each of your flows, you have options like edit, view analytics, settings, clone, and archive. We'll be dealing with the analytics section today. You can select it by clicking the flow card, or the analytics graph icon on the relevant flow in the menu in the upper righthand of the flow card. 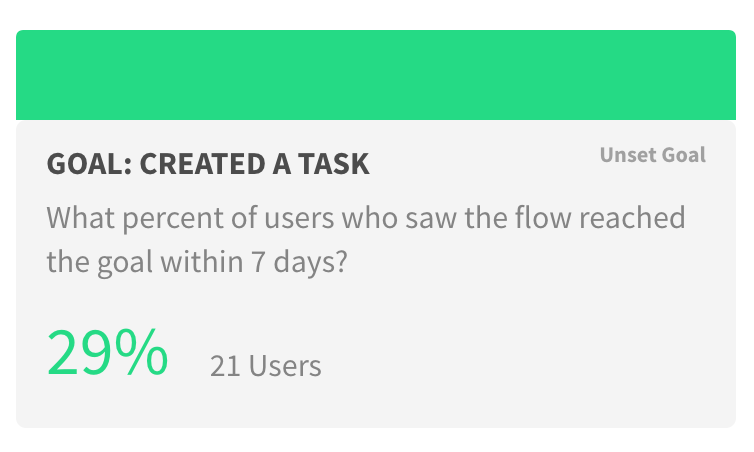 Activity contains high-level data about how many users have seen and completed a flow. Of those users, it also measures how many went on to complete the specific goal you set (more info on goals here). This section measures the overall effectiveness of a flow, in terms of completion rate. You'll also notice a version selector at the top right-hand corner of this section. This is where you select the iteration of the flow you would like to measure (marked each time changes are pushed to a flow). You can also select "all time." This feature is useful for finding out whether recent changes to a flow were effective in driving improved performance. Goals measure how many users saw (but not necessarily completed) a flow, and then went on to take the intended action in the app. You can select a goal via the dropdown pictured above. 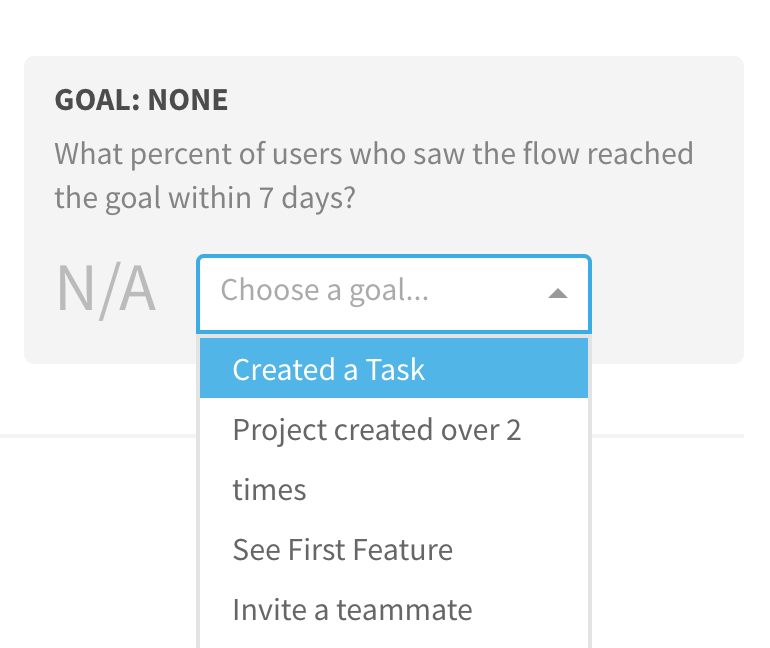 To change the goal attached to a flow, simply click "unset goal," and select a new one from the dropdown. 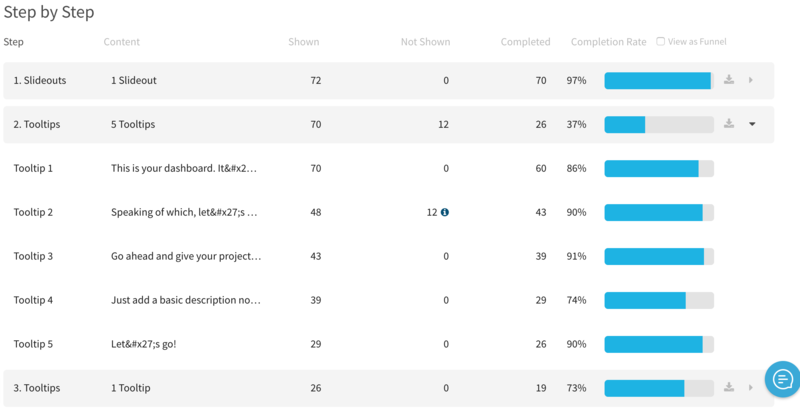 The step by step analytics section shows you where in your flow users are dropping off. This way, you can go into the flow and change or remove the parts of your flow that aren't performing! By clicking the arrow on the far right of each step, you can see the individual components of that group (individual tooltips, modals, slideouts, or hotspots). In this section, you can also download the CSV data behind each step, by clicking the download button just to the right of the progress bar. Why Aren't My Flows Showing?